Breaking News: PokerHost Announces Surprise Closure July 31, 2018! The PokerHost room, on the Winning Poker Network, has just announced that it will be closing for good at the end of July. Customers are urged to withdraw their balances “as soon as possible.” Cashouts via Bitcoin and Skrill will be processed without any additional surcharges while the normal fee schedule will apply to any withdrawals requested via other channels. According to our sources, the PokerHost brand will be retired altogether, and poker will not be accessible anymore to its customers. They will have to find another place to play cards online. There have not been any statements by PokerHost as to why this decision was taken. It came as a surprise to almost everyone, us here at Professional Rakeback included. However, there were certain signs that all was not well with the site for some time now. Over the past several months, we heard through the grapevine that PokerHost had been shopping around for a new network. However, industry sources have indicated to us that none of these discussions panned out. Now that the vast bulk of WPN traffic comes from network-owned and -managed brands, it's possible that PokerHost had felt itself to be increasingly sidelined and marginalized as an independently owned skin. During June, all references to PokerHost disappeared from other websites maintained by the same ownership group. These include SBGGlobal.eu, BetRoyal.com, Sports-Gambling.com, and BetNow.eu. 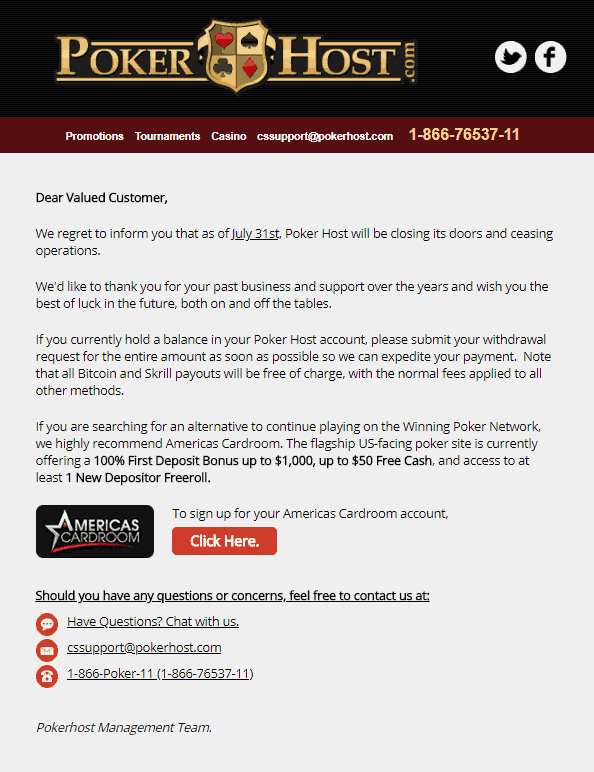 It's therefore possible that the retirement of the PokerHost name could have been in the works for at least several weeks notwithstanding that it was only communicated to users on July 3. On the other hand, websites change all the time, and so we must be wary of reading too much into what, after all, might have been just a coincidence. 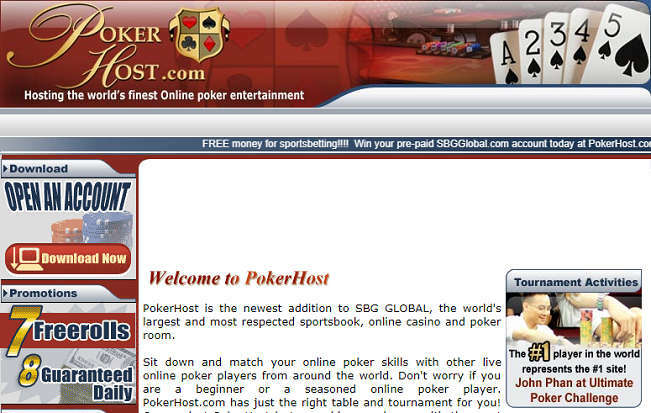 PokerHost has been involved in the online poker scene since 2005. Originally launched by SBG Global on the Dobrosoft Network, it has since moved to Tribeca, Microgaming, Cake (now Horizon Network), Merge, and the Equity Poker Network. The latest move, from Equity to the Winning Poker Network, came in December 2014. 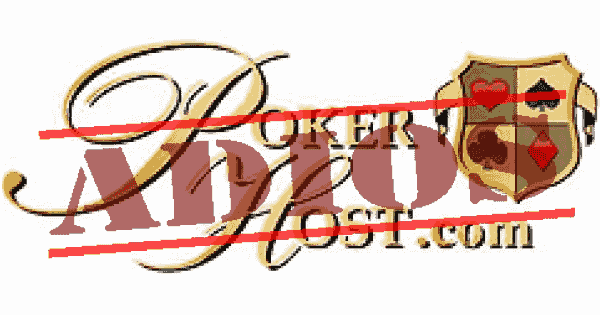 In a certain sense, PokerHost had gone full circle because the WPN is descended from the old Dobrosoft Network, the original home of the site. We wonder how much they had to pay to retain the services of “the #1 player in the world“ John Phan? While all this shuffling around shows a certain footlooseness and wanderlust on the part of PH management, customers have been treated with respect throughout this entire time. Some of the site's departures stemmed from a desire to remain in the U.S. market when parent networks abandoned it. Such was the case with the Tribeca and Microgaming networks. At other times, as with the Merge Gaming Network, there were disagreements between the room and network higher-ups. Player balances were faithfully transferred over to PokerHost's new platform whenever it was changed. Whatever else one might say about this poker room in its various incarnations, it has never been seriously accused of the non-payment of winnings. Indeed, it has scrupulously kept its cashier functions separate from those of other companies, enabling it to survive and thrive even when other network operators have experienced financial difficulties. PokerHost's menu of exotic methods of payment for longtime customers, like bank wires and direct deposits, has often put it a notch above its competitors in this department. PokerHost has earned its reputation as a reputable online poker provider. While this boutique poker room has never had an especially large user base, peaking at about 20% of the traffic on the Merge Gaming Network back in the day, PH has always been a trustworthy business and one with a loyal following of fans. Perhaps nobody knows the team members at PokerHost as well as their business partners. We reached out to Phil Nagy, CEO of the Winning Poker Network and he told us that "It is great to see someone can close a poker room right." He also noted that the business relationship ended on good terms and that it had been a pleasure working with PokerHost. San Jose, Costa Rica – July 3, 2018 – The Winning Poker Network (WPN) today confirmed that partner site Poker Host will no longer be part of the network as of July 31st, 2018. The site, which operates independently from other Winning Poker Network card rooms and is not owned or operated by WPN, is ceasing operations. Those who wish to continue to play on the Winning Poker Network can create a new account at a number of WPN sites, including flagship Americas Cardroom. The US-facing online poker site offers a Welcome Package for first depositors that includes a 100% bonus up to $1,000 (200% if using a cryptocurrency), 20 days of free cash up to $50, and a seat in all New Depositor Freerolls remaining in the calendar month. 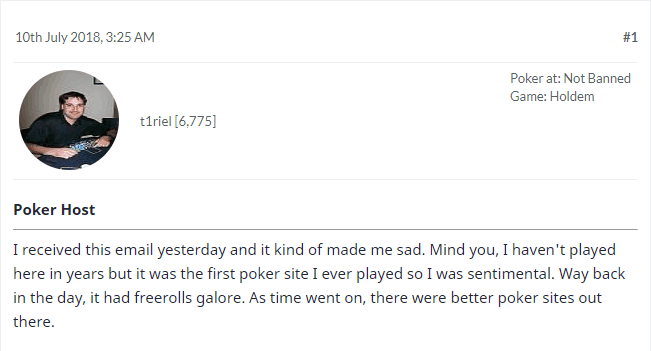 We can't help but notice a quite frank discussion of the Cons of playing at Americas Cardroom in the bottom paragraph. Maybe PokerHost is snarkily taking a final shot at its network “partner” before disappearing for good? Whatever the truth of this may be, we feel that ACR is one of the most reputable places for our readers to play. 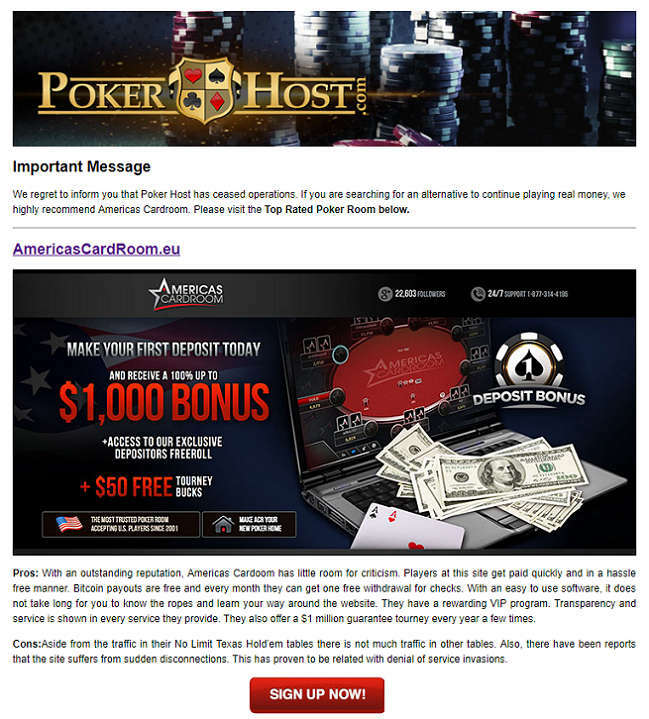 If you're a PokerHost account holder who's wondering where to play now, then perhaps Americas Cardroom is the best choice for you. It has 99%+ of the same games as PokerHost, missing only a few of the exclusive freerolls and other promotional tournaments. With your first deposit, you'll qualify for a 100% up to $1,000 poker bonus (20% rakeback rate) along with $50 in complimentary funds and entry in up to four New Depositor Freerolls. Read our Americas Cardroom review page for more details. If you are hoping to play on another network, might we recommend the Pai Wang Luo Poker Network who recently upgraded their mobile poker client to include MTTs and SNGs! If you want an entirely new place to call home as an American fan of card games, then consult our guide to the best sites that allow you to play poker online. If you're a resident of Canada, then we advise you to browse over to our Canadian online poker overview instead.